Injuries to the feet and lower legs can be debilitating due to the inability of victims to place weight on body parts that are responsible for bearing most of their weight. Victims may face painful recoveries and be forced to take time off from work while they focus on rehabilitation. The Chicago auto accident attorneys of Rosenfeld Injury Lawyers LLC understand that every day that you are kept away from your occupation only puts you even further behind in meeting your financial obligations. We can help you recover the compensation you need to pay your medical bills and physical recovery so it doesn’t become a financial burden. The inability to walk without assistance can cause mental and emotional stress on victims suffering lower body injuries. It impacts their independence and can force them to seek assistance from a loved ones to perform tasks that were once easy to complete. From the feet to the hips, the lower body is responsible for supporting the entire weight of the body and for its mobility. Our Chicago auto injury lawyers have helped clients with the following types of injuries. Injuries to the knee — The knee is an instrumental joint that serves a critical function in the ability to walk. It is comprised of tendons, ligaments and a protective kneecap and is one of the most complex joints in the body. Dislocation of the knee joint, a torn PCL or ACL and hyperextension of the ligaments surrounding the knee can temporarily and permanently inhibit the ability to walk or run properly. Injuries to the thigh — When the body is thrown forward in a car or truck accident, it can collide with the instrument panel, steering wheel, or dashboard. Airbags provide protection to the face and upper body but do not cushion the knee or thigh. Many broken femurs are the result of the knee or thigh striking an object during a collision. Injuries to the hip — If a vehicle is struck from the side or thrown sideways into another object, it is possible for an occupant to suffer a bruised or broken hip. Depending on the type and severity of the injury, recovering from a hip injury can be a long, painful and expensive process. Injuries to the ankles and feet — The feet and ankles support the entire body. Fractures, strains and sprains can make it impossible for a victim to place any weight on the affected area. During an accident, it is possible for the ankle or foot to be twisted, crushed, caught between moving objects or broken. Our Chicago auto injury lawyers know that lower body injuries are often accompanied by physical and financial pain. 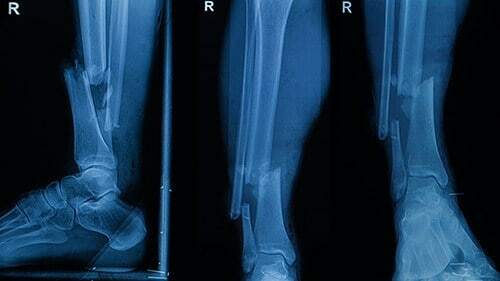 Broken bones require time to heal and torn joint ligaments can require surgery to heal properly. While victims undergo medical procedures and endure months of physical therapy, they are often unable to return to work or participate in activities they once enjoyed. When seeking financial compensation for your injuries, we will take all of the following into account. The expense of emergency medical treatment along with the cost of follow-up treatment or surgical procedures. Out of pocket expenses incurred during the healing process and rehabilitation after suffering injuries. The cost of the physical therapy required to help you recover your mobility. The value of wages that were lost due to your inability to work during your physical recovery in addition to any lost opportunities linked to your injury. Damages for any permanent disability which has resulted from your injury. If you are permanently unable to return to work or you can no longer enjoy the quality of living you once had, you may be able to recover additional compensation. The value of the pain and suffering you endured during your physical recovery as well as any suffering you will endure because of your ongoing complications or permanent injuries. Injuries to your feet, ankles, and legs can impair your mobility and threaten your independence, which may lead to emotional distress and the financial burden of hiring assistive care. If you have been injured in a car, truck, or motorcycle accident, it is important for all of your accident-related costs to be considered when placing a value on your claim. Insurance companies will make every effort possible to challenge the need for medical procedures, therapy, and other expenses. Our Chicago auto injury lawyers have access to medical professionals, social workers and other professionals who can help defend the value of your case and ensure you have the best possible chance of collecting all the financial compensation the law will allow. Rosenfeld Injury Lawyers LLC represents thousands of clients who have suffered injuries to their feet, ankles, and legs in a car, truck and motorcycle accident. To learn more about how we can help, contact us to speak with one of our award-winning Chicago auto accident attorneys. We will evaluate the details of your case, discuss your legal options and answer any questions you have during a risk-free consultation. If we are unable to secure damages on your behalf for any reason at all, you can be assured that our time and services will be completely free of charge.